Although I wish I had my very own classroom I'm very excited to say I found a substitute job! So using the idea a teacher I taught with last year (Thank you Kristen!) did I made business cards. I blurred out my phone number. If you work for the Bellevue School District or St. Thomas Private School and are looking for a sub give me a call! I figured I would continue to keep my blog going and share ideas that I used over the past couple years of teaching in my classroom. One activity that my students LOVED last year was with the book, "The Legend of Spookley the Square Pumpkin" by Joe Troiano. This is a great story to share with your students that has an awesome message reminding us that we are all the same even if we look different. After discussing the story my students colored their very own pumpkin. I copied them on white construction paper and pre-cut them out to save on time. Here are a few other October activities I have done in the past. This idea was shared with me from Mrs. Crowder! :) What a fun activity! To save on time pre sort the amount of toothpicks for each student and precut tips for the fingers and toes! The students traced their feet (with their shoes on) and added a ghost face. This activity the students traced their hands on black construction paper. I cut them out the night after and had them glue together and add eyes. They picked their favorite book wrote the title and the author on the orange paper. 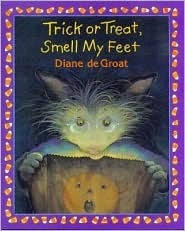 And here is a collection of some of my favorite October read alouds! It was a pleasure discovering your business card template the other day. I came up here today hoping to get something new. I was not dissatisfied. Your ideas upon new methods on this business card template were insightful and a wonderful help to us. Thank you for having time to write down these things and for sharing your mind. I love your favorite book web idea. It's way cuter then what I usually do. I'm so glad to see that you're subbing. I hope it (quickly) leads into a full-time job for you! Miss you! Minimax positivo business card template is really superb. More i like the green, pink and yellow. Love the font selection, really eye-catching font. keep blogging. Thanks for sharing. Hey! Great blog! I have a question for you about your business cards; they look so nice! I am a recently graduated and certified teacher. 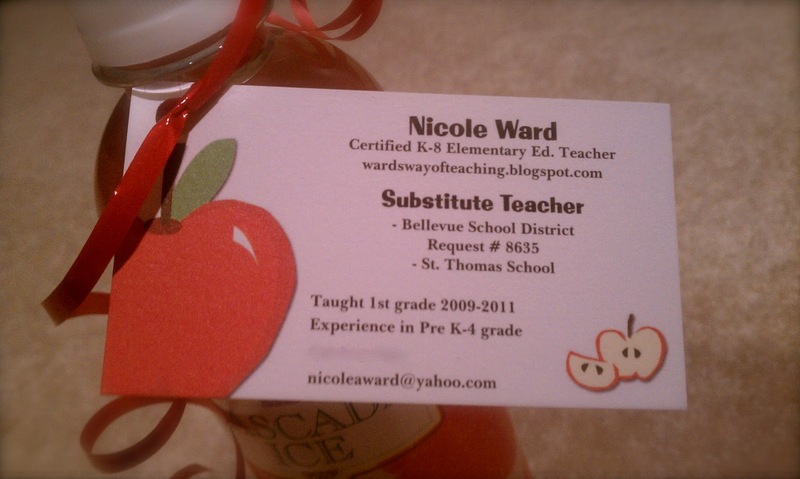 I am getting my substitute license tomorrow, and I thought handing out business cards would be great. Did you leave them at the front desk with the schools you were familiar with? In my program, I was with two schools, but I'm hoping of finding a way to get my name and face out there with other schools in my area. Thanks for sharing! Hi Ashley, thanks for taking a look at my blog. The district I'm subbing for has 13 elementary schools! Huge district. So what I did was attach my cards to a drink. My husband works for a bottling company so I was able to attach my business cards to the various drinks for free. I received so many compliments from teachers and principals that having my card attached to the drink made me stand out above the other subs who dropped off their card. I know that could be pricey to do, so I would suggest if you wanted too attach it to a bottle of water. I used different color ribbons to attach it to the drink. You can get a case of water for a few bucks and if it will get you more sub jobs then hey you will earn the money back quick. And teachers love water! Then I took them to the schools during lunch time and some secretaries let me put them in the teachers boxes but almost all just wanted me to put them in the lunch room on the table and since I went at lunch I was able to say hi and introduce myself to some of the teachers. Another thing I did was if I got a sub job at a school I took the drinks/cards on the day I subbed at their school and set it up in the lunch room. I promise attaching your card to water bottles will make your card stand out more and the teachers will request you! Hope this helps. Thanks so much! I will definitely try this very soon! I love your business card! It is exactly what I want to provide my mother with (she too has a degree in teaching but is subsituting at this time). Can you share your template?